What did the key of David do? It opened the door into the King’s palace. It also closed the door to the King’s palace. A rope was put through the key and it hung over the shoulder and down the back of the keeper of the key, who was in a very powerful position indeed. In the passage from Isaiah, we hear that this power has been abused by Shebna, who is replaced by Eliakim as the new key holder. The one who now holds the key of David is the Risen Jesus and the words of the prophecy of Isaiah are alluded to here. What does the Key of David open now? The Key has opened the door to the heavenly Kingdom and the door remains open because of the Philadelphians’ proclamation of the name of Jesus. When I saw him, I fell at his feet as though dead. But he placed his right hand on me, saying, ‘Do not be afraid; I am the first and the last, and the living one. I was dead, and see, I am alive for ever and ever; and I have the keys of Death and of Hades.’ (1:17-19). 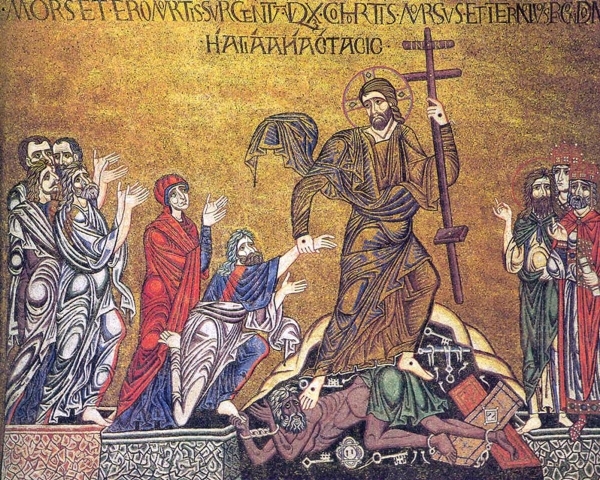 In the picture from Saint Mark’s in Venice, we see the risen Jesus leading the captive people into freedom. It is Adam and Eve and their descendants that he is drawing out of the prison walls of death and the darkness. We also see him bestriding the figure of Hades whose scattered keys are now useless, because the key that opens the gate that has imprisoned the captives is the cross of the Risen Lord. Why do we pray this antiphon in the lead up to Christmas, when it is much easier to associate Christ’s journey into the realm of darkness and death – his descent into Hell, as the Apostles’ Creed has it – with Holy Saturday? Well, the language of keys can help us to express something fundamental about Jesus and about the Church. ..if the offender refuses to listen even to the church, let such a one be to you as a Gentile and a tax collector. At first sight or hearing, this seems to be a formula of exclusion, but the praxis of Jesus towards tax collectors and Gentiles subverts its apparent meaning. In the gospels, we see over and over again people being healed and restored to their family and community. Not only that, but we hear the parables of Jesus which have the power to unlock our imagination and move from the ordinary, from the everyday, to a place of transformation. The logic of integra­tion is the key to their pastoral care, a care which would allow them not only to realize that they belong to the Church as the body of Christ, but also to know that they can have a joyful and fruit­ful experience in it. They are baptized; they are brothers and sisters; the Holy Spirit pours into their hearts gifts and talents for the good of all. Their participation can be expressed in differ­ent ecclesial services, which necessarily requires discerning which of the various forms of exclu­sion currently practiced in the liturgical, pastoral, educational and institutional framework can be surmounted (§299). God is not able to forgive wrongs done against other persons: only the person wronged can offer forgiveness. This is a consequence of taking responsibility seriously. Even if we do not entirely agree with this, to take it seriously is to begin to draw people in from exclusion and darkness, to use the power of the Key of David to let them in. The newness of the child whom the antiphons celebrate challenges us to begin again not to remain locked into destructive patterns. [i] There are two other places in Revelation where a key is mentioned: 9:1-2 and 20:1-3.